I had this friend in high school who would have a cigarette and a Diet Coke for lunch. She always seemed to have a can of it in her hand. Her behavior mystified me because I thought that both the cigarette and the Diet Coke tasted awful. Many years later in graduate school, I faced a set of vending machines every time I wanted a break from my challenging studies. That is when I decided that I not only liked Diet Coke - I LOVED Diet Coke. Here it was, a treat without any of the calorific consequences of the Snickers bar - Hurray! I started drinking 2-3 cans per day. I had formed a “Diet Coke Habit” just like my pal in high school. I really didn’t see anything wrong with it. Lately, there have been some studies that say that artificial sweeteners can lead to weight gain see: Three Reasons to Rethink that Diet Coke You’re About to Drink. I’ve gotten quite a few e-mails from people who want to stop drinking it and I want to support those readers. How did I stop drinking it? The short story is that I started drinking sparkling water (also called club soda or seltzer) when I was pregnant with my daughter. I was avoiding caffeine and I just never started drinking it again. For those who don’t want to get pregnant to end their habit, I have some much better suggestions. Try mixing the ½ Diet Coke and club soda. You can cut your daily intake in half in one short step and you will be amazed how much this tastes like full strength Diet Coke. For every time you drink a glass of water instead of soda, put the money in a jar that you saved. Make sure you can see the jar fill up with all the cash that you can spend on something else. Get a home soda maker (see below) and mix the sparkling water with a little orange or apple juice. This tastes much better and is better for you. Find some cans of seltzer with natural flavors (no sweetener added) in your supermarket. 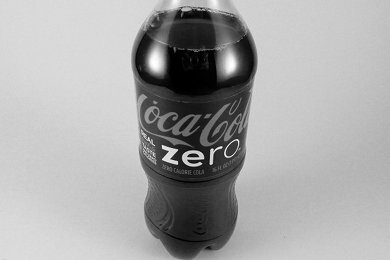 It tastes a lot like soda but has zero calories see: A Refreshingly Sweet Zero Calorie Beverage With No Artificial Sweetener. I did find that after a year of not drinking Diet Coke, I no longer liked the taste. Diet Coke was something that I had gotten accustomed to, like holes in my socks that I should throw out. Just buy new socks and drink something that tastes better. How do you deal with your soda or Diet Coke addiction? I allow myself one can a day. I usually have it with lunch and that's the only one I get all day. Otherwise I drink water etc. I used to drink a few diet cokes a day. When I started Weight Watchers, I stopped drinking it during the week and I allow myself to have one on weigh-in day, and I drink it if I am on vacation. All other times I drink water and hot tea. Some years back I wanted to stop with the artificial sweeteners as well, so I cut out all soda and started drinking carbonated water. No sodium or sugar but a nice taste. No more soda at all! I think Diet Coke has ingredients that are addictive. It doesn't taste particularly good but I drink it anyway. I try to only drink it occasionally. I read in a book to think about what it is I am actually craving so when I want the soda, I figured out it was the carbonation I really wanted and started drinking seltzer that way. Love to get a fresh line to squeeze in like at restaurants. I find the glass bottles taste better than the plastic ones too. I decided to give up diet coke (all soda) in March of this year and just quit, cold turkey! I don't miss them at all now but the first time that I had pizza without a diet coke was hard! I have 2 small cups of coffe in the morning and water or green tea through out the day. I, too, used to drink a can or two of diet vanilla soda (not the brand you mentioned, but the other big one) a day. As this wiki entry http://en.wikipedia.org/wiki/Excitotoxicity acknowledges, it may be biased toward certain views, but -- to me -- it sure doesn't seem like a far leap to believe that the manufacturers of no-calorie sweeteners either aren't terribly concerned about its ill effects or, worse, that they know about the ill effects and that diet-drink makers keep using it because it creates an addictive cycle in us unwitting consumers. While I'm no expert at any of this, I am certain that our species existed for an incredibly looooooooooooong time without any of this kind of garbage and diet drinks just don't align with my general non-garbage dietary approach, so no more diet (or other) sodas for me. I primarily drink water these days, but when I'm feeling frisky, I'll stick a hibiscus tea bag in a bottle (http://www.amazon.com/Ello-PURE-Bottle-Silicone-Sleeve/dp/B007XXPHGO/ $10 from the big red discount store), fill it up with (distilled) water, and refrigerate the assembly for 12-24 hours. I then remove the tea bag, sweeten it with a little honey, shake it up, and enjoy. I imagine I'll be making and enjoying more hot herbal tea as winter rolls in. Interesting, I just had this conversation with a nutritionist who gave me this explanation: "Carbonation is theorized to actually bind to fat cells. This causes a slowing down of fat loss, thus making it much more difficult to lose weight. Furthermore, when you ingest a carbonated drink you are essentially ingesting air. It may taste tingly, but by ingesting air you bloat the gastrointestinal tract. This causes a slow down of digestion, which is another important factor in weight loss." After hearing this, I'm ditching the carbonated water also. I did a blog post back in August on this very subject with how I was able to quit the soda addiction! I have never had a diet coke habit (regular yes, and I recently stopped because it was giving me acid reflux). However, my mom did have the diet coke addiction. She was developing symptoms similar to MS. On the advice of a friend in the medical profession, she researched and found that aspartame has been proven to cause these symptoms. She stopped the habit and her symptoms went away. I was never a big soda drinker anyway. One glass with dinner at night. That's it. So when I decided maybe Coke Zero isn't a good idea anymore, I switched to diet ice tea. No problem. Doesn't flat and lasts longer too. I am trying to cut down on my consumption of diet coke as well. I am more concerned with the acidity of it and the effect it will have on my teeth. I have switched ( and reduced from 2 a day to about 3 a week) to diet root beer as it is 3 or 4 times less acidic than diet cola and try to substitute iced water with cucumber in it. I am wondering if carbonated water would effect your teeth as well. Thanks for the article! I switched from Coke Zero to Sprite Zero/Diet 7 UP/Diet Gingerale to reduce my caffeine intake while trying to get pregnant. But I also have read/heard that the artificial sweetners/carbonation can be just as bad. I have yet to find a way to kick Sprite Zero and I have 1-2 a day. Any suggestions? I only have one can of diet soda per week - it is my treat over the weekend. But, I tried seltzer, and it tasted so bad I dumped it down the drain. Seriously, how does anyone drink that stuff? I just drink plain water. I use to be a big soda drinker. I stopped when I had chemo. All I could taste was aluminum can. It was aweful. Even 6 yrs later I have found that I assosicate soda with aluminum cans and dislike the taste. Even soda from a fountain. I highly recommend not going the chemo route to quit drinking soda but it did work for me. I was never really into soda, but I would have one a couple times of month as a treat. I quit cold over 3 years ago, for no other reason that I knew it was bad for you. I read something once, that if you have even 1 soda every day, and you cut it out completely, you can lose about 20 pounds in 1 year without doing a single other thing. I still have the occasional diet soda but have moved on to seltzer water with a squirt of lemon juice. Another benefit of the sodastream is no recycling, bottles are reusable. We bought ours and i was skeptical but now love it. We sometimes add a shot ofdifferent torani syrups, at least you control the amt. i am diet coke and try to be art. Sweetner free since last fall.